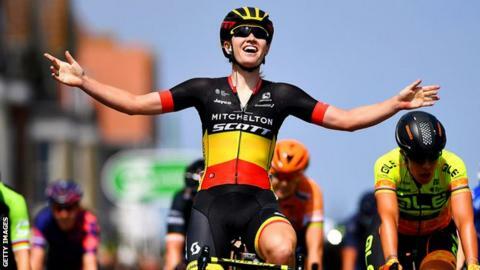 Suffolk has been announced as the host of the opening stage of the 2019 Women's Tour. This year will be the fourth time Britain's biggest women's pro-cycling race has started in the county. Framlingham hosted the opening stage last year, with American rider Coryn Rivera finishing second before going on to take the overall title. This year's race - which starts on Monday, 10 June - has been extended from five to six days. Full details of the Suffolk stage, and the rest of the race route, will be announced next month. "We are delighted to be able to confirm that Suffolk will host the OVO Energy Women's Tour in both 2019 and 2020," said race director Mick Bennett. "Suffolk have been involved as a host venue since the first edition in 2014 so the extension of our partnership for a further two editions of the race shows the support in the county for the event and their aims to get more people more active."